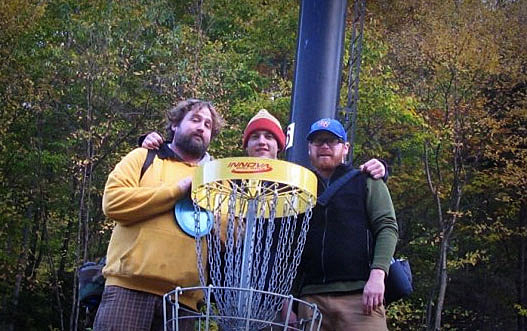 Once upon a time, three lads in Vermont set out to master the sport of disc golf with the hopes of rising to the top of the professional ranks. Try as they might, however, reality took hold and this fairy tale wasn’t going to have the normal ending. Instead, it led to something different, yet still connected to the sport of disc golf in a positive way. In 2011, Bachnein was formed by friends James Sweat, Taylor Johnson and Justin Kaulius. The trio, based in Burlington, Vermont, worked on creating original disc golf apparel and heavily promoting the game. Some past products include shirts, hats and disc dyes. Bachnein owners, from left, James Sweat, Taylor Johnson and Justin Kaulius. The goals were simple — organize sports, grow the sport in the state (and beyond) and create merchandise that would appeal to the masses. So maybe the fairy tale will eventually have that ending? Who can tell. But for now, Bachnein is focusing on merchandise and apparel, graphic design, directing tournaments and promoting the sport. The name is interesting. It has a definite disc golf feel, though the spelling seems a little different than many would normally see. Thinking back to the days of middle school and high school, most people can probably recall that one artistic kid who would doodle on people’s binders and scrawl intricate scenes for the most mundane of assignments. Duncan Crawford was that kid. Duncan Crawford at work on a design. 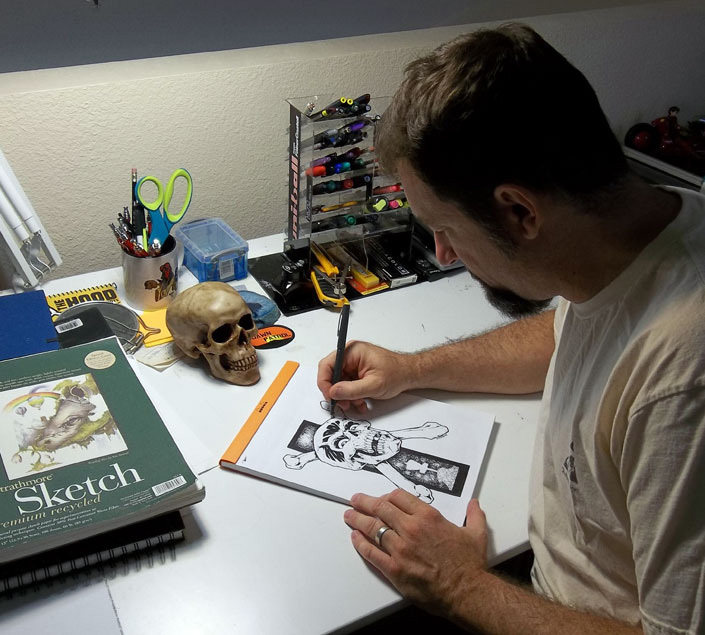 As an adult, Crawford has taken his art from the notebooks to the disc golf course, as he pens unique, skull-filled custom stamps under the moniker Skulboy Designs. Known for aggressive, hand-drawn renditions of skeletons, skulls, and images both mythical and historical, Crawford has gained a following among disc golfers looking for more than the traditional stamp on their plastic. And while his designs have developed a following, their gestation was born out of simply wanting something interesting for himself. Based in Monrovia, California, Crawford is surrounded by a bevy of courses and an established disc golf scene, which is where he found his path to stamp design. 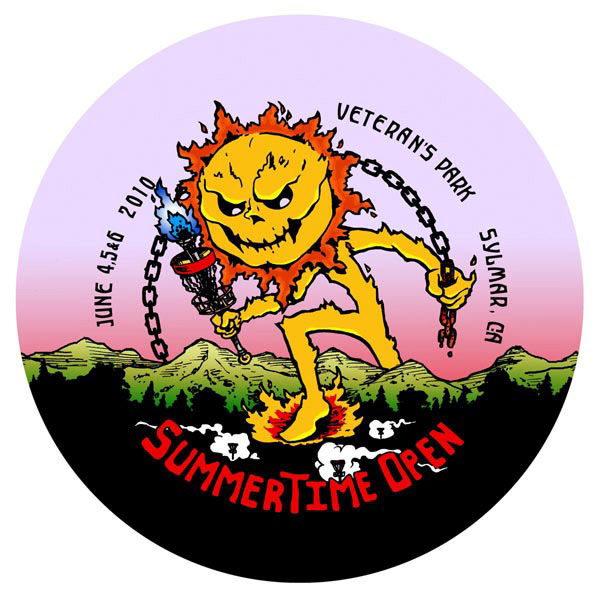 Playing many rounds at Sylmar Veterans Park – home of Steve and Bamba Rico of Legacy Discs – helped Crawford jump into the process by designing a custom stamp for the course’s 2010 Summertime Open. The disc design that helped get it all going. Crawford’s relationship with Bamba Rico was what really got the business off the ground. But when Crawford began to explore the idea of putting more of his designs on discs to sell on his own, he found the bulk orders that Innova and other manufacturers required to be cost prohibitive. But a chance opportunity soon came his way — in the form of missing out on a tournament — as he was able to meet Dan Mangone, the owner of Discovering the World, a disc golf shop that happens to be the main West Coast distributor for Latitude 64 golf discs. It seems like a marketing ploy. Sure, the name NutSac may get some giggles and laughs. But in the end, name withstanding, it’s a quality bag made for the everyday player who isn’t always concerned about carrying dozens of discs. Founded in 2008, NutSac LLC is a one-man company (besides sewing contrators) who handles the aspects of the business, from marketing to shipping to everything in between. The business was originally founded by two friends, but when it became evident that business was not going to be able to support two people for at least two years, Greg Kise took control of the business as the second partner (who still has a minor stake in the business) wanted to move on to other projects. Kise said he had plenty of experience “bootstrapping small businesses,” so he was able to build. And just like that NutSac, based in Corvallis, Oregon, started its journey. One needs to back up a little before getting a grip on NutSac.